Miami students are working on diverse projects using ecological big data. This work can involve high-frequency sensor data, long-term field sampling data, and GIS data, as a few examples. MiEBDI hopes to match undergraduate students who are interested in working with ecological big data with relevant projects. Below are showcased a few examples of current student work on ecological big data projects. Undergraduate students interested in working on a project with ecological big data can download and follow the instructions on the following application to pair up with a potential supervisor. Doan 'Donna Nguyen': "I am an undergraduate student majoring in Statistics and Economics. With great guidance from my Graduate Student mentor Rachel Pilla, I have been able to not only learn about ecological data, but also to study many new analytical techniques for times series data. Further, I have participated in collecting high-frequency empirical data at several lakes to calibrate simulation models for climate data. I am grateful for the MiEBDI Experience for the chance to apply my Statistics background and be able to assist the research team by providing statistical expertise and creating data visualizations. Along with our interdepartmental collaboration between Biology and Statistics, Rachel and I have also worked with Dr. Thomas Fisher (Statistics) to devise simulation-based models for air temperature and precipitation as input for Rachel’s lake model. "In summer 2018, I travelled to Lacawac Sanctuary to help retrieve data from the miniDOT string sensors. These devices were deployed underwater to collect lakes' year-round dissolved oxygen and temperature data. These information were recorded every 15 minutes and the resulted big data file can be used for comparison between the mild winter of 2016-2017 and the current winter of 2017-2018. In the winter of 2016-2017, a unique period of mid-winter ice thaw was captured by using the high-frequency sensor strings in the clear and brown lakes. Preliminary analyses suggest the lakes were frozen for several weeks, followed by an anomalous mid-winter ice thaw when temperatures rose, followed by refreezing to complete ice cover less than a month later. Based on this interesting observation, we are investigating the significant changes in oxygen dynamics in winter that can lead to a 'legacy' effects in the lakes in spring and summer." Kai Li is a senior computer science major. 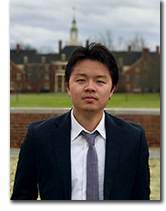 He is an MiEBDI-CADS student intern working on a project to develop a protocol for Miami students and faculty to archive big ecological data in the Environmental Data Initiative (EDI), an NSF-supported repository for ecological big data. EDI was created in response to the growing need to archive and share large ecological data sets. Kai has developed a protocol for archiving data in this repository and has archived a 30-year data set from several Pennsylvania lakes in EDI (Limnological data from the Poconos Mountains, Lakes Lacawac and Giles, Pennsylvania USA 1988-2016). 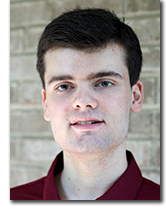 Nicholas Jerdack is a statistics Master's student, working on a project as an MiEBDI-CADS intern during the Spring 2018 semester. Nicholas has been working on a collaborative project to compile temperature profiles from 150+ global lakes, from more than 50 worldwide research groups. These data will be submitted for publication in the journal Nature Scientific Data, for which Nicholas has been compiling and presenting the metadata on each of these lakes. Christine Daley (left) and Aaryn Gray (right) use a drone to collect their data. Christine Daley is a senior majoring in Geography and minoring in Urban and Regional Planning. She interned this summer with the Geospatial Analysis Center (in the Department of Geography) and is continuing this internship this Fall and next Spring as part of the honor's program. Her research involves tracking parcelization (subdivision of parcels) in the exurbs of Butler County, OH from 2004 to 2014 and examining associated land cover changes. The parcel datasets contain 60,000+ parcels, and she has 3 years worth of data. For each parcel she determines whether it has been subdivided over time. Using 1-meter spatial resolution land cover data, she is determining land cover proportions on each parcel and assessing trends in land cover changes on the subdivided parcels compared to other residential parcels. After graduation she plans to attend graduate school for urban planning. Connor Lambert is a Master's student in Nancy Solomon's lab studying the evolution of monogamy in prairie voles in relation to a specific brain region. Over two summers, Connor monitored the behavior of over 400 prairie voles at the Miami University Ecology Research Center. This project consisted of two different, but related, experiments that lasted 15 weeks each summer, and involved tracking and trapping voles to examine their social and mating behavior. 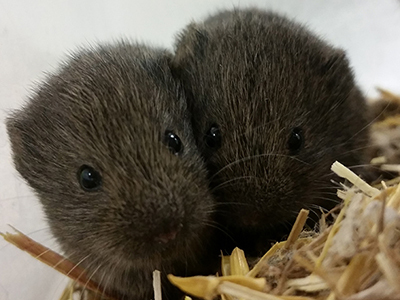 Every adult vole was equipped with a radio-collar, and each adult was radio-tracked multiple times per week and its location marked using a sub-meter accuracy GPS. Connor and his undergraduates also trapped voles in the morning and evening through much of the experiment, and for every captured vole it was noted which specific animal it was, where it was trapped, with whom it was trapped, its reproductive status, and its weight. Furthermore, Connor and his team collected DNA from every vole to determine the parents of any offspring born in the enclosures. With these large data sets, Connor determined which males and females lived in the same nest together, the areas that males and females used, and the parents of all of the offspring born (over 500 total!). This allowed him to examine which males formed monogamous partnerships with a female compared to males that were less disposed to do so, and how many females a male fathered offspring with. For future research, Connor will determine the density of receptors in specific brain regions. This will allow him to determine if this part of the brain influences monogamy in prairie voles in natural settings, and in turn inform future research into the evolution of the social brain and monogamy. This can better inform us about how the brain controls social behavior not only in voles, but across other mammals — even in humans. 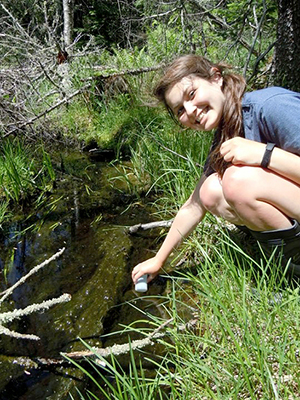 Rachel Pilla collects a water sample in the field. Rachel Pilla is a PhD student in the Global Change Limnology Laboratory in the Department of Biology, and is researching a variety of lake responses to climate and environmental change using long-term data analyses, high-frequency sensor data, and modeling efforts. As part of the Global Lake Ecological Observatory Network (GLEON), Rachel is co-leading the Global Temperature Sentinels project, and has compiled the world's largest dataset of long-term vertical temperature profile data for over 150 lakes across the globe. With this dataset, she is working to understand the thermal changes in lakes over decadal time spans and the primary climate and geomorphological drivers of these changes. 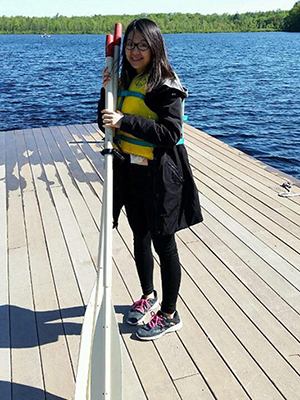 She is using high-frequency sensor data of temperature, dissolved oxygen, and light from 3 lakes in the Pocono Mountains to understand seasonal changes in lake ecosystems, including lake mixing, wintertime patterns, and phenological changes. Rachel is also interested in the biological responses to these changes in lakes, and is building a model to understand the potential changes in water quality and habitat availability for zooplankton in conjunction with the Center for Analytics and Data Science (CADS). This model will be used to project future patterns in lake ecosystems and the consequences for aquatic organisms and water quality. Lauren Adkins (PhD student) and Abby McBee (Biology undergraduate) are collaborating on a study to investigate relationships between dissolved organic carbon (DOC) concentrations in lakes and reservoirs and the risk of infection by waterborne pathogens and illness from disinfectant byproducts in the Northeast United States. Previous studies indicated increased DOC concentration correlated with decreased transparency of photosynthetically active radiation and ultraviolet light in lakes. Ultraviolet light is a powerful disinfectant for chemically-resistant pathogens and dissolved organic matter reacts with chemical disinfectants producing carcinogenic disinfection byproducts. New cases of waterborne diseases are reported and mapped by arbitrary boundaries (i.e., county, state, country), which may not relate to where pathogen or toxin exposure occurred, proving challenging for determining the cause of the outbreak. Ms. Adkins and Ms. McBee are applying geographic information system (GIS) and statistical techniques to analyze large datasets, including county health data, national soil survey and land cover data, along with state and national water quality sampling data to answer the question of whether regions experiencing rising DOC concentrations in lakes warrants consideration for future risks to public health.